Home / All Huawei Network Unlock Tool V1.0.2 Download Free. / videos / All Huawei Network Unlock Tool V1.0.2 Download Free. 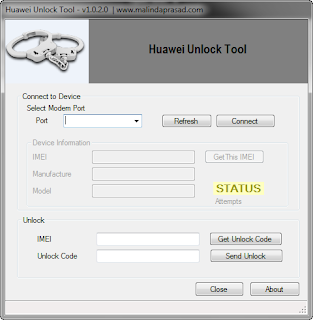 All Huawei Network Unlock Tool V1.0.2 Download Free. Many huweai phone come on other country.this phone used can used for other network sim they can need network unlock.This tool support bro if you put sim on your phone then can need network lock pin only work.this tool worked only for used imei calculate network pin. How To Network Unlock This Tool? 1# Open your phone back cover. 2# See imei and put on tool. 3# Just click get unlock code. 4# Put unlock code on your phone. 1# Connect your phone on pc. 3# Types imei code on tool. 7# Download All Huawei Network Unlock Tool V1.0.2 .